It’s a great milestone when babies learn to pick food up with their tiny fingers and feed themselves. Your toddler will also want to take control of their own meals most of the time. This is when to give them healthy and delicious foods like fruits and veggies, whole grains, meats, fish, beans, and more healthy foods so your baby or toddler will learn to like these foods from an early age. We give you 5 easy to prepare natural, nutritious bites your babies and toddlers will love! Green peas are very nutritious and perfect for your baby’s little fingers. It’s also a great way to teach them to love their veggies. 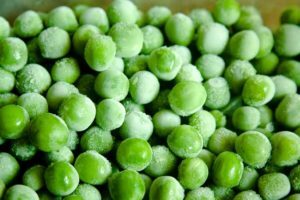 If your baby is teething, frozen peas will feel so good on their aching/itchy gums. Eggs make another great finger food for your little one. Scramble them up in a pan or boil them and slice into small pieces for your baby to handle. They might not need any seasoning depending on your child’s age. (No salt if your baby is under 12 months). If you love to eat chicken, there’s a high chance baby will absolutely love them too. Remove the skin from robust and tender chicken thighs, boil, roast or barbecue them and shred them into tiny flakes. Yummy! Who doesn’t love sweet, delicious watermelon? It’s a great finger food for your child. It is easy hold and chew even for toddlers who don’t have many teeth yet. Cold watermelon is also great for teething babies. We know fish is very nutritious as it provides babies with DHA, a fatty acid important for brain development in the first 24 months of life. Steam the fish and cut into small pieces or flakes. They are soft and easy to chew. Be mindful of the bones! I’ll definitely try all of these for my 3 year old. Post more recipes for kids!